Can KAZA benefit wildlife and people? 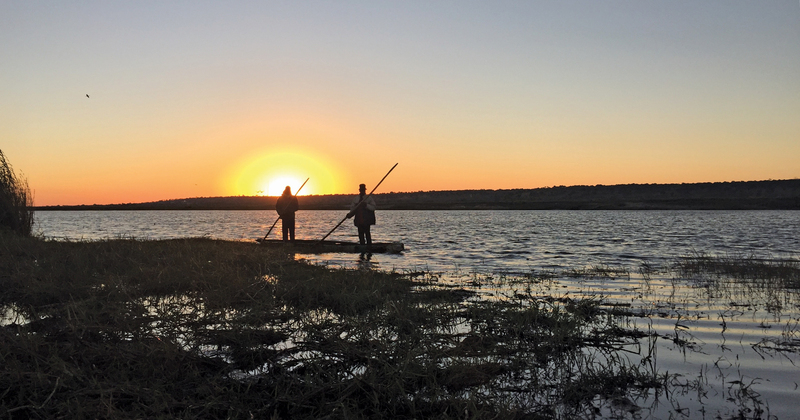 Forming the border between Namibia and Angola for more than 400 km is the Okavango River, lifeline of the Kavango people, who make a living from fishing, cattle farming and cultivating sorghum, millet and maize on the wide fertile plains on either side. Closely related to the Owambo, the Kavango also originate from the large lakes of East Africa. Archaeological diggings place the arrival of early Kwangali settlers around the 1600s, although the VaGciriku, VaSambyu and Hambukushu might have arrived later. They first settled near the Kwando River in Angola, moving south of the Okavango River between 1750 and 1800. Today the Kavango people consist of five individual tribes, namely the Kwangali, Mbunza, Shambyu, Gciriku and Mbukushu, each inhabiting an area of its own along the southern bank. The Kwangali and Mbunza tribes have similar social practices, such as preparing young boys for manhood and young girls to take care of a household. The two tribes speak the same language, namely Rukwangali. The split between the Shambyu and Gciriku tribes occurred when they were settled on the southern bank of the Okavango River 47 km east of Rundu, opposite Rundjarara. The languages spoken by these tribes, Rushambyu and Rugciriku, are very similar. The Mbukushu, who speak Thimbukushu and live in the eastern part of Kavango, differ socially and ethnologically from the other four tribes. Each tribe is ruled by a traditional chief or chieftainess, assisted by headmen. The chief has the overall ruling power over his tribe and custodial power over the land that falls within the jurisdiction of that tribe. Like most other groups in northern Namibia, the Kavango social organisation is based on the matrilineal system. This penetrates all spheres of social life, in particular family law, the law of inheritance and succession, the marriage system, political structure and traditional religious system. The traditional economy in Kavango is based on a combination of horticulture (pearl millet, referred to locally as mahangu, sorghum and maize) and animal husbandry (cattle and goats). Today, thousands of young Kavangos work as migratory labourers on farms, in mines and in urban centres. An important local industry is woodcarving. Bowls, masks, ornaments, furniture and other functional items are produced for the tourist and other markets. Woodcarvings ranging from animals to carved doors are also sold at the Ncumcara Craft Shop, 35 km south of Rundu in the Kavango Region. Much of the rapid population growth in Kavango has been the result of immigration from Angola. The fifth Living Museum, the Kavango Living Museum, was opened in 2011 in the Kavango Region at Samsitu Lake, 14 km west of Rundu. 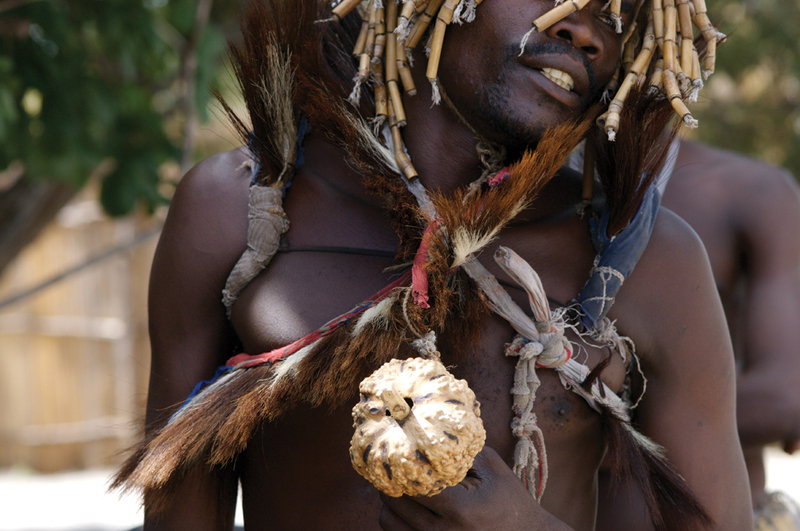 It represents a traditional village of the Kavango people, who have lived in this area for centuries. With the demonstration and preservation of the fishing and land-cultivating culture of the Mbunza an essential part of its interactive programme, the main focus of the Mbunza Living Museum is to provide visitors with a detailed insight into traditional, pre-colonial culture. Of about 90 000 Zambezians, previously known as Caprivians, recorded in the 2011 census, 86 000 live in East Zambezi, which borders on Angola, Zimbabwe, Zambia and Botswana, and 4 000 in scattered settlements in West Zambezi. There are two main tribal groups, the Fwe in the west and the Subia in the east. The vast majority of Zambezians live along the riverbanks next to the major roads; or in and around the main centre Katima Mulilo and the villages of Sibinda, Sangwali, Linyanti, Chinchimane, Bukalo, Ngoma and Isize. In addition to hunting and fishing, Zambezians till the soil, planting maize, millet, beans, sweet potatoes, groundnuts, pumpkins, melons and sugar cane. They are also gatherers and pastoralists, with well-structured usage of the communal grazing areas. Their isolation and remoteness from the rest of the country are largely responsible for their continued dependence on this traditional subsistence economy. Most Zambezians are linguistically related to the Lozi and Makololo of Barotseland in Zambia. The Valozi are the descendants of the Kololo Kingdom, established by Chief Sebetwane of the Bafokeng (originally from the Orange Free State in South Africa), who crossed the Zambezi River in 1838 and overpowered the Luyi. The largest Zambezian tribal groups are the Masubia and Mafwe. Other tribes are the Mayeyi, Matotela, Mashi and Mbukushu. As a result of their historical social interaction with Zambia, Zimbabwe and Botswana, the majority of Zambezians speak English as a second language. In addition, many of the men worked for some time on mines in Johannesburg, and hence learned to speak Fanagalo. This is the only region in Namibia where Afrikaans is spoken minimally. Within communal areas there are different levels of traditional authority. In eastern Zambezi each village has a headman, generally the most senior male member. He advises the senior headman, who represents several villages. The senior headmen act as local representatives on the tribal council or kuta, over which the ngambela (chief councillor) presides. The kuta is the highest legislative, administrative and judicial body in the tribal area. In western Zambezi, traditional authorities are less structured, but are similar in that authorities range from the local village headmen to a chief who is in charge of a large area. In Zambezian society the family is the most important socioeconomic unit. Families usually live in villages. Two systems are distinguishable in the social organisation. The Masubias are patrilineally oriented, while the Mafwe reflect distinct matrilineal features in their rules of succession. The form of government consists of hereditary chieftainships, one for the Masubia and one for the Mafwe. Most Zambezians are subsistence farmers who make their living on the banks of the Zambezi, Kwando, Linyanti and Chobe rivers. Land is cultivated under a system of individual right of occupation as allocated by the people’s authorities. Grazing and veld products are used on a communal basis. In addition to fishing and hunting, a significant but not exclusive element of the local economy, they keep cattle and cultivate the land. When the Zambezi and Chobe rivers come down in flood, more than half of Zambezi east of the Kwando may be under water. During this period Zambezians use their mokoro (dug-out canoes) to traverse the routes normally used by trucks and pedestrians. 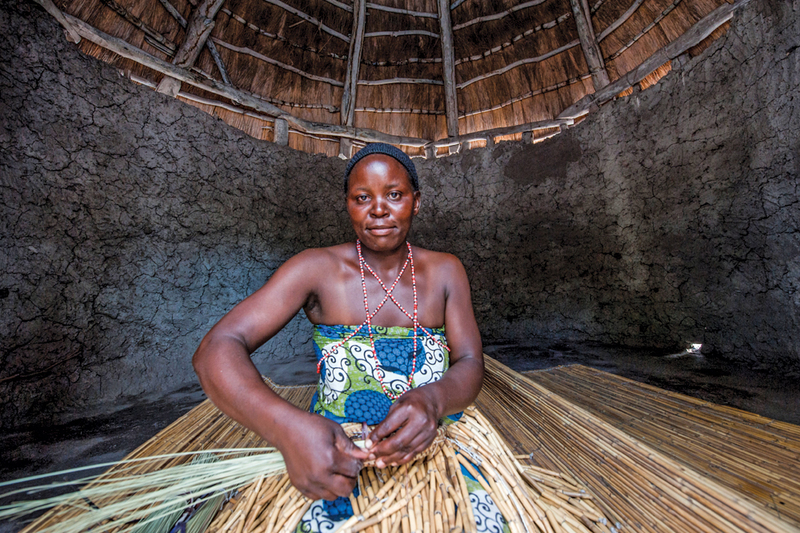 In the Zambezi Region baskets are still used by women in the mahangu fields when harvesting and winnowing their grain, which has enabled many women to create a vibrant and successful craft industry and establish a valuable source of income. Situated 118 km west of Katima Mulilo in Kongola on the road that leads to West Zambezi, the Mashi Tourism Hub is a centre for selling crafts produced in the conservancies of the area. The centre offers a great variety of different items, such as the unique khwe fruit collection baskets of West Zambezi, once used to carry fruits from the field, and the open East Zambezi baskets used when harvesting crops and sifting millet and maize flour. Necklaces made from mbono and other seeds are also for sale here. Once ground and boiled in oil, the mbono seeds were used as a lotion for skin and hair. The crocheted bags were introduced when there weren’t sufficient palm leaves for weaving. They are made from narukuku, fibres taken from fields and soaked in water. Reed mats and woodcarvings are to be found in this stylish craft centre. Information on local produce, tourism attractions and the well-appointed community campsites is displayed at Mashi. An informative poster display provides an opportunity to find out more about the conservancies, community forests and parks in the area, the flora and fauna, history, topography and details about the culture, basket-making and other traditions in the region. The tourism hub offers an outlet for the work of over 300 craftspeople, among them men who make the woodcarvings. The baskets and beadwork are done by the women, enabling them to bring an income into the household that pays for their children’s school fees and clinic costs, or possibly a larger purchase such as a cow. The craft shop also allows the women to improve their skills and, most importantly, to keep the traditional skills of basket weaving alive, as many 21st-century western-world items replace the implements and vessels once used in everyday life. A colourful event takes place each year in August at the Mashi Crafts market in Zambezi. The Mashi Crafts Festival provides an opportunity especially for craftmakers, primarily women, from all over Zambezi to adorn their brightest and finest chetenges and show off their artistry. They compete for prizes and present traditional dances and plays to their colleagues and guests. A tourism information centre was established a few years ago as an additional leg to the business. The Zambezi is home to many fine potters, due to their free access to clay soils and wood for the ovens. Because the region lies sandwiched between Botswana, Angola and Zambia, the Zambezian craft-makers are influenced by an active crafts industry in neighbouring countries. The Zambezian artists have possibly been more receptive to the western notion of producing art for art’s sake than artists in other regions, as can be seen in their sculptural guns and bicycles carved from wood. While traditional pottery is produced in Owambo and Kavango, the art of the potter in Zambezi has evolved over time. Beautiful pots with spherical bodies and slender necks are created, often with intriguing patterns and interesting firing techniques, making them much sought-after by collectors. While Namibia isn’t commonly associated with woodlands, forests and forest management, in Zambezi pristine forests cover large areas of land. As well as providing livelihoods for many of the rural poor, these forests are essential as the safekeepers of the water-support system and wildlife habitats of the country. In 2004 the Namibian Government established the Community Forestry Programme in the north, targeting forest, woodland and savannah areas owned by local communities. The premise is that if local people are obliged to manage their community forests sustainably, they will in turn receive the right to manage and market forest products and other natural resources to generate income. This combination of conservation and business opportunities is a driving force in poverty reduction and enhancement of rural livelihoods. The Zambezians celebrate their traditional culture at the end of August with the Zambezi Regional Cultural Festival. Traditional dances, music, food, values, language, handicraft products and customs are celebrated as tools of uniting people from different ethnic groups. The festival stresses that local culture should be promoted and practised in schools, as young people are crucial for keeping cultures alive elsewhere in the world. The annual Masubia Cultural Festival takes place in July at Bukalo, the traditional headquarters of the Masubians, about 40 km east of Katima Mulilo. The festival brings together Masubians from Namibia, Botswana and Zambia. According to Masubian tradition and culture, the ceremony is a way to draw memories from people with Masubian ancestors coming together to share historical memories and cultural and developmental ideas. The ceremony also serves as an opportunity in which all Masubia-speaking people present gifts to their chief as required by their culture. The current Masubia chief is His Royal Highness Munitenge Kisco Liswani III. About 25 cultural groups from the Zambezi Region, Botswana and Zambia entertain festival-goers at the Lusata Cultural Festival, presented by the Mafwe people and popularly referred to as Lusata. Activities include cultural dances by various groups, church choirs blessing the attending crowd with their singing, and a few sketch performances. The highlight of the day is when the current Chief, George Simasiku Mamili VII, steps forward to address his people. Rounded off with traditional Lusata dishes, this event is well-attended by chiefs, delegates and tourists from all corners of the globe. The festival takes place in October at the Lusata headquarters of Chinchimane, about 70 km south of Katima Mulilo. Opened in 2008, this Living Museum is an authentic open-air museum where guests can learn about the traditional culture and original lifestyle of the Mafwe, demonstrated and described with great dedication, with translations into English by the guide. Most of the programmes are interactive, with the Mafwe enjoying it when the visitors try to weave a traditional net and taste their meals. Visitors can spend the night close to the museum in a basic bush camp, or stay in one of the surrounding accommodation establishments. The museum, independently managed by the Mafwe of Singalamwe, is situated on a scenic hill with a view over the Kwando River. It also hosts a craft shop.